Home » Barkerville » Barkerville is open for the 2013 season (oh… and tea with Queen Victoria, too)! 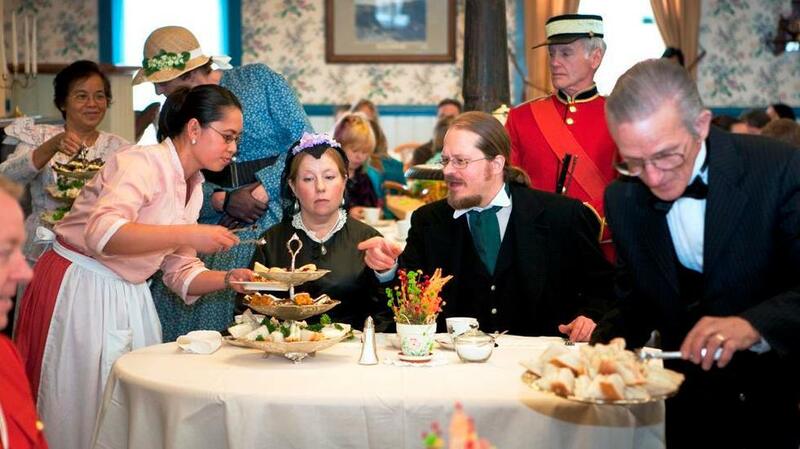 Barkerville is open for the 2013 season (oh… and tea with Queen Victoria, too)! Barkerville Historic Town is now officially open for its 55th season as western North America’s largest living museum, and in a show of appreciation for more than half a century of community support, site admission is by donation throughout the Victoria Day long weekend. Barkerville will kick off its special event season on Monday, May 20th, with the popular Victoria Day Royal Tea at the historic Wake Up Jake Restaurant and Coffee Saloon. “Queen Victoria,” “Prince Albert,” and a host of colourful characters will be on hand to greet guests and usher in Barkerville’s 2013 season with an appropriate amount of pomp and circumstance. “While, historically, Queen Victoria never actually made the journey to Barkerville, or even to British Columbia itself, we are proud to interpret what it might have been like had Her Majesty made the treacherous journey to the goldfields nearly 150 years ago,” Douglas said. Queen Victoria was the longest reigning monarch in British history, at 63 years, seven months, and two days (June 20, 1837 – January 22, 1901). Her influence and interests contributed directly to the growth of the entire British Empire during her sovereignty, and she inspired an entire era. Barkerville’s Victoria Day Royal Tea will have two sittings, at 1:00 pm and 3:00pm, at a cost of $15.00 per person, plus GST. Children up to11 years old pay their age (a nine year old would pay $9.00, for example) and children 4 and under are free. For more information on the Victoria Day Royal Tea, or any of Barkerville’s 2013 season of special events, please visit http://www.barkerville.ca/special_events.htm.